This is considered Bursa’s greatest monument. The Green Mosque is a beautiful building, built in an Ottoman Turkish style just beginning to emerge from the influence of the Seldjuk empire. 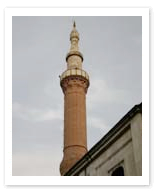 When this nearly 600-year-old mosque, like much of Bursa, was destroyed by an earthquake in 1855, it took nearly nine years for more modern builders to restore it to its former grandeur, giving you an idea of the complexity of its construction. It is still unfinished, lacking a portico, and will it seems most likely remain that way, graceful and beautiful all the same.